Rahman’s Chambers is one of the leading law firms in Bangladesh and has recommended by Legal 500, Chambers & Partners etc for its corporate practice. My primary responsibilities are given below: 1. Drafting Statements of Claim, Defence, Argument and Different types of court applications. 2. Drafting different types of Agreements. 3. Drafting of Legal Notice, Reply to Legal Notice. 4. Legal opinion. 5. Vetting. 6. Legal Research. Rahman’s Chambers is one of the leading law firm of Bangladesh and has recommended by Legal 500, Chambers & Partners etc for its corporate practice. I have completed my Intern under the supervision of Mohammed Forrukh Rahman, Barrister-at-Law, Advocate, Supreme Court of Bangladesh. He is also a Fellow of FHKIArb, ACIArb, ASIArb, CEDR (UK) Accredited Mediator. National Board of Revenue (NBR), Bangladesh is the authority to certify Income Tax Practitioners. Income Tax Practitioners are those who represent tax payers and prepare tax returns and provide legal consultancy to the tax payers. 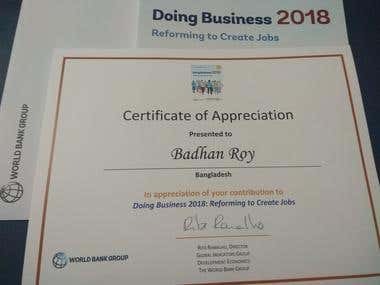 I have acknowledged as a Contributor for my contribution to Doing Business Report 2018. The Doing Business project provides objective measures of business regulations and their enforcement across 190 economies and selected cities at the sub national and regional level. The Doing Business project, launched in 2002, looks at domestic small and medium-size companies and measures the regulations applying to them through their life cycle. The Liberation War Museum, Bangladesh was established in 1996, dedicated to all freedom loving people and to the victims of mindless atrocities and destruction committed in the name of religion, ethnicity and sovereignty. The Museum every year arrange a 7 (Seven) days residential program for graduates and young professional from different countries named as Winter School. I have participated in the 4th Winter School and successfully graduated. I started [login to view URL] is a legal blog to spread out the legal knowledge to the common people and at the same time to raise awareness to the common people about different legal issues. We also provide free legal advice through our expert volunteers.